On May 3, Delta College’s MESA (Mathematics, Engineering, Science Achievement) program hosted a banquet for its graduating students and their families. Enrolled in MESA are over 63 engineering majors, 60 computer science majors, 52 biology majors, 26 chemistry majors and 8 math majors. Of these students, 31 of them are graduating this year. “The next time I see you, I want you to come to my office and say ‘Mr. Vargas, I completed my bachelor’s degree or master’s degree,” said Dean of Agriculture, Math and Science Salvador Vargas to the room. “I hope for you this is the beginning, not the end,” he added. MESA is a program that was founded 40-years ago to help low income and first generation college students achieve success in the math, science and engineering world. “What we do is, we give them (students) as much experience and exposure as possible,” said MESA Director Cassandra Hernandez-Vives. “Nobody does this on their own, you have to reach out and find people,” she said. Aside from exposure to experts and field trips, MESA focuses energy on building strong study skills that students can use when transferring to a four-year university. The program also helps students receive scholarships and internships. Hernandez-Vives said most first generation students lack the necessary skills to compete in the world economy, which is why MESA is so important to low income families. “It’s a change in culture, It’s a change in mindset,” said Hernandez-Vives. Salvador Vargas, dean of agriculture, mathmatics and science addresses students and their families at the banquet held on May 3. 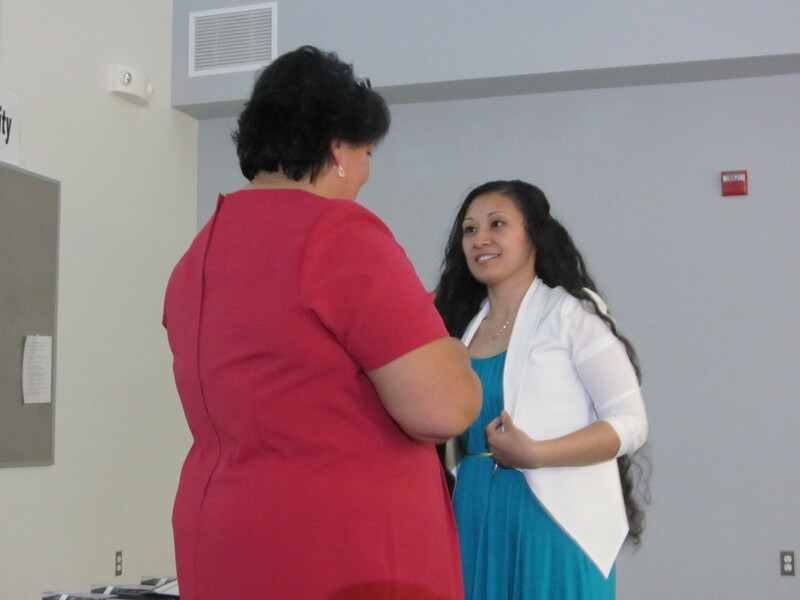 Cassandra Hernandez-Vives presents Lee Juarez with a diploma and MESA pin at the banquet.